On our last afternoon in New York last week, I sat on a bench in Union Square with our book editor. Justin, who has become a good friend, opened a large envelope and pulled out something as a surprise. “It’s your paperback,” he said. Danny and I both gasped. We’ve been so busy working on our next cookbook  the one that comes out in April  that we had almost forgotten. Our first cookbook is now out in paperback. We’re still proud of this cookbook, Gluten-Free Girl and the Chef . For me, it’s a treasured memento, a flip through time of the first years of our lives together, in recipes like white beans slow simmered in olive oil and rosemary, smoked salmon and tomato napoleon, warm rice salad with avocados and roasted chicken, and fennel-cherry salad with basil. Every recipe not only reminds me of the first time Danny and I ate those foods together, but they also remind me of the first few months of Lucy’s life. We created those dishes in the kitchen of our house in Seattle, with her sitting in her bouncy chair, far away from the stove. Whenever we finished a dish, we put it under her nose, to smell all that food and love we created. (The other day, she smelled a pasta dish with pesto and said, “Mama, this definitely has basil in it.”) Those were porous, exhausted, wonderful days. So I love this cookbook as a memory for me. But Danny and I both still feel proud of it. There’s so much food in there that’s great for celebrations, dinner parties, and meals you want to make with the people you love. Should you need a gift for the holidays, may we suggest this cookbook? Oh! And I forgot to mention that we have updated all the baked goods recipes in this book to give you directions for using psyllium instead of xanthan or guar gum, in case you cannot tolerate much of the gums, like me. As much as I am proud of our first cookbook, I have to share this: I’m really in love with the one that’s coming out in April. Gluten-Free Girl Every Day. It really is an everyday cookbook. The recipes for this book were created from daily practice. Where the recipes from our first book came from Danny’s memory of dishes he made at restaurants across his career, the recipes in our new book were inspired by making dinner for our family. It’s a big difference. I wanted to call this book Feeding Lucy. For marketing reasons, we had to stick with Gluten-Free Girl. I understand. But I still think of it as Feeding Lucy, to tell you the truth. You see, Danny and I no longer have meals at midnight, the way we once did. We don’t experiment with new sauces and complicated preparations on Sunday afternoons, with nothing else to do but slow dance in the kitchen between courses. These days, there’s a small child tugging on my leg, saying, “Mama, I’m so very hungry, right now.” There’s nothing more urgent than a kid who wants to be fed. The food in Gluten-Free Girl Every Day is how we eat now. And it’s how we’re going to be eating for years to come. It’s food made in season, based on a well-stocked pantry. (We’ll share with you what’s in our cupboards and the refrigerator in our house.) It’s filled with great vegetables and fruits, whole grains, and interesting proteins. Some of the dishes have meat. Some don’t. We eat meals based in flavors from around the globe  smoked paprika, fish sauce, and berbere mix  to show our daughter that people eat differently around this world. These spices and herbs also make the simple preparations feel more complex in the tasting than they are in the making. It’s not a book that promises dinner will be ready in less than 20 minutes and use fewer than four ingredients. This is still real cooking. This time, however, it’s smarter cooking. We make a big pot of whole grains, like brown rice or millet, and freeze the leftovers in 2-cup portions. Time for dinner? Pull out some cold brown rice and make a quick fried rice with bok choy, bacon, and mushrooms. We make bigger portions to freeze later for leftovers the next week. We spend part of Sunday afternoons simmering a big pot of beans until they’re creamy, whisking together a ponzu sauce or packing lemons, salt, and sugar into a clear jar for quick preserved lemons the next week, and thinking about the dinners we might want to make with the haul from the farmers’ market that day. There’s nothing too fancy. Nothing too complicated. Just good food, meant to be shared together. This is a cookbook for busy families who still love to cook. You see, we all want to feed our kids as well as we can. And of course, we want that food to be healthy to help them grow. But after a few nights of roasted chicken, quinoa, and a vegetable, life at the table can grow a little boring. And so, our book is organized like this: each chapter is a different strategy for getting dinner on the table. There’s a stir-fry chapter, based on the hundreds of stir-fries made in that wok up there. (You want a lot of vegetables, a lot of taste, and not much time? This is your method.) There’s a breaking-down-a-chicken chapter, where we show you how to use every single part of the chicken, including the bones, to make great meals for days. There’s the one-pot wonder chapter, the pasta chapter, the meat chapter, the grilling chapter, and the rice and beans chapter. In the buffet chapter, we show you how we learned to fill the table with little bowls and saucers of ingredients and let the kids make their own plates. (Nothing makes my 9-year-old picky nephew happier than a taco bar where he can pluck cheese from a ramekin to finish his own taco.) We’ll share the 2 or 3 recipes that make a difference when you make them from scratch - homemade corn tortillas, carnitas, and pickled carrots - and which ones are fine to get at the grocery store. I might like the breakfast-for-dinner chapter best. Biscuits and sausage gravy, anyone? Of course, I’m also partial to the desserts chapter. I really wish I could give you this book right now. For now, however, we need your help. You see, we were blessed to work with Penny Des Los Santos on this book. (I told you a little about the photo shoot with her and her team last year, where you can see some of the dishes from the book.) Her photographs are unbelievable. Wait until you see this book. We had several ideas for the cover of Gluten-Free Girl Every Day. The marketing team dwindled them down to these two. The one on the left is a grilled salmon with a grilled lemon-bok choy-jalapeno relish. The one on the right is a whole-grain millet waffle with smoked salmon, creme fraiche, and capers. Both dishes were a huge hit with the photography crew. Tell you the truth, we can’t go wrong with either of these covers. But we’d love to know from you - which one do you like best? Which one would make you pick up the book? We just can’t wait to share this book with you. Oh definitely the second one. It’s bright and intriguing. The salmon dish isn’t something that someone looking for gluten free recipes would be especially inspired by. But gluten free waffles? I’d certainly pick that up and look at it. I agree. Salmon is always gluten free unless someone mucks it up. But the idea of gluten free waffles, yum! I hate to say it, but when buying a gluten free cookbook or reading a gluten free blog, I expect that 80 to 90 percent of the recipes are for things that aren’t usually gluten free but have been adapted to be made gluten free. Recipes for braised chicken or grilled salmon, well, I don’t need those or can get them elsewhere. Sorry Danny! But a recipe for a gluten free pot pie — I need that! I’d be more likely to take notice of a gluten free book with a waffle on the cover. The alchemy of GF baking is what gets me to consider buying a GF cookbook. Same thing for me – Waffles are one of those “forbidden things” for most gluten-free people – the thing that we assume will never taste as good again or be as easy as the old Eggos one. Knowing that i have the possibility of eating one that looks like THAT? Sold! Definitely the waffle one, for the aesthetic reasons listed above. The colors are brighter, the title stands out better, and it just looks better. Looking forward to it! No matter what, I predict it will eclipse book numero uno by a significant margin. I like the first shot. Without analysing it too much, I just think the green tones made it look fresher. I too would pick it up if it had waffles on the cover – mostly because cooking salmon is something I can do with one hand tied behind my back, but waffles – sweet, crisp-yet-soft-in-the-middle, light, great-tasting, syrup-soaking waffles – well, let’s just say all attempts at all the recipes I’ve found so far have been utterly disastrous. I agree – it’s the alluring waffles for me, too…especially a more savory preparation! If you have Shauna’s first book, we make those waffles ALL the time, though I do add double the amount of liquid called for in the recipe, as it not only makes more waffles, but it makes them crisp on the outside and light and custardy on the inside. I agree with Jenn, but she expresses it much better than I can. Even though I am not crazy about salmon, thinking that Everyday and a dish that looks this exotic would go together? Yes! I agree that the salmon photo is more in line with the Every Day title. However, that’s only noticed by literary minded people (kudos to you all!). I’m not sure if Shauna is marketing specifically to the literary minded folks out there who would appreciate a photo reflecting the title. If her audience is non-literary people like me, then I can tell you that we instantly look at the picture and rarely analyze the photo:to:title relationship. I like the look of the first one too. light and fresh and easy looking. the waffles with salmon don’t appeal to me. Why does it say “with Daniel Ahern”? Is his participation different from the first book? As usual, your writing is spot on – I don’t put in quite as much cooking, and breakfast for the kids can be quite harrowing – but it brought back last Sunday morning’s french toast, and a tear to my eye. Anyway, for the cover – NUMBER TWO because two plates (dinner for sharing) and warm tones. The colours in the waffle cover appeal to me more, the symmetry as well. But I guess a hundred people a hundred opinions. My husband has been off gluten for two month now, I am baking your bread from the first cook book most weeks with some variation (love chestnut flour in it). He says it is the best gf bread he had and really nice in it´s own right. Thanks for that. I agree with the reasoning that the waffle makes the gluten-free point better, but in terms of a beautiful, appealing picture, I would go with the salmon picture. That’s the one that would make me pick it up, but I’m perhaps not your primary target audience as I don’t eat gluten-free, I just love your blog! Oh how I love the alternate title, Feeding Lucy. I know ALL about those hungry little mouths. So excited for this new cookbook!. I am drawn to the salmon cover and to me it speaks of ‘every day’. Though waffles are lovely, they feel like more of a weekened treat. From a design side I would go with the waffles. One you can clearly see the food. It is the showcase. Two it follows the same feel of your first cookbook. It makes it look like they belong together. From a searching for a gluten free cook because that’s what I eat, waffles all the way. Most proteins are easy enough to make gluten free in my opinion but I always look at waffle type recipes. I mean they’re waffles! Good luck in deciding! I’m excited to see the book. I prefer the waffle cover. It has a stronger emotional impact on me than the salmon. With the way the lighting is coming in from the side, it makes me feel as if the two plates of waffles are set out for a two friends or lovers sitting across from each other at a cozy little table by a window in a warm kitchen. I picture long conversations and comfortable companionship with someone you love. The grilled salmon makes me hungry just looking at it…but the waffle made me jump back up to the title of your blog to see whether you were gluten free or not (I surf vegetarian blogs too). Wow! Waffles again! Wouldn’t that be great? Unfortunately I have a tiny kitchen and no waffle iron. Will be on the lookout for your book. Definitely cover number one! It´s clean, modern, contemporary, screams health. Just beautiful. Congrats on book number two! The waffles for sure – the other one is too “chef-y”! The waffle cover, because gluten-free homemade waffles are a treat and a wonder, especially with salmon and creme fraiche! It makes me wonder what other normally verboten goodies I can find in this gluten-free cookbook. Salmon is already gluten-free. So I am not as intrigued. In fact, I am a bit annoyed that a gluten-free cookbook is featuring something inherently gluten-free on its cover. Where’s the allure? Where’s the promise of regaining access to formerly denied foods? Both of these photos look absolutely sinful. You couldn’t go wrong with either. I am, however, a waffle addict and thus would certainly pick that one up for sure. I’m very excited for your new cookbook. My husband is newly gluten-free and it’s been a challenge for us to find quick and easy, everyday meals. This cookbook will most certainly be one of my most used. You know the one, with the stains on the pages and everything dog earred and ragged from overuse. I also like the waffles better, though both covers are beautiful. In terms of the layout, I like that the title doesn’t break the cover the picture of the food; it fits perfectly between the two plates. And I too feel more drawn to the picture for its colors and warmth. The other difference is that the waffles on the cover are a signal (to someone who hasn’t read your blog) that the recipes in the book will also teach how to make new versions of foods that are traditionally made with gluten. The picture of the salmon doesn’t show that. Each might appeal to a different audience (maybe someone looking for a gluten-free cookbook because they want to cut carbs would be more drawn to the salmon picture for example), but I feel like the waffles tell me more about the breadth of the recipes inside. Loved reading the comments on this one as much as the post… we celiacs have a thing for our waffles! I would reiterate that a gf salmon recipe is not a hard thing to find – waffles however are a treat (and for the everyday celiac, come out a box in the freezer). The flip side to this argument, is that EVERYDAY – for most us, means no time to wip up batter and make waffles AND something to go with them. The salmon looks like something I could pull together quickly on a Tuesday after a long day at work (oh, and I should mention that I would likely feel healthier and more virtuous for having eaten it, than waffles for dinner). Both are beautiful Shauna – I’d buy either! I’m just going to second this comment, since it pretty much says what I was going to say. I just think the color and feel of the waffles one caught my eye more. I like the salmon one better. I agree with the people who say that waffles are better for a gluten-free cookbook, but I don’t think of your cookbooks as primarily GF cookbooks. If I want a cookbook that only has baked goods I’ll go elsewhere. Your cookbooks aren’t like other GF cookbooks, and by putting an “already GF dish” on the front, this helps to signal that. Also, I like the picture better. Feeding a family? Nothing says I love you like a homemade waffle! 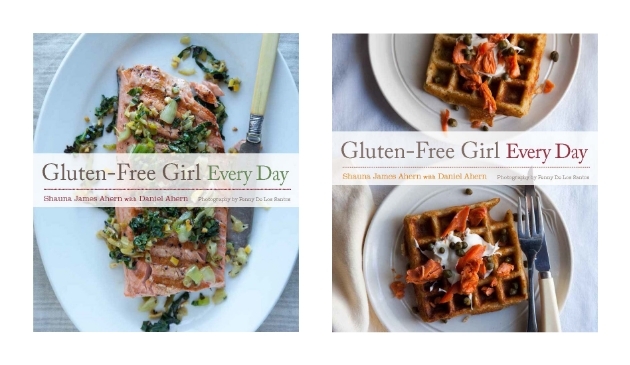 The salmon cover is sooo beautiful but if it is to focus on glutenfree then it really should be the waffles – that probably will be the first recipe I try. I love the alternate title but understand the marketing process. Too bad you can’t combine them into something like “Feeding Lucy – Glutenfree Girl II”. I am really looking forward to the new book and the paperback version will dfinitely be on the Christmas list for my evergrowing number of GF friends. Definitely the waffle cover. And oh how I wish you could have called it “Feeding Lucy”! I have a five and a half year old and everything — EVERYTHING — in our food-revolving life has changed since she was born. Shauna, you make life easier for a lot of people. I vote for the waffles! They look more fun (savory waffles for dinner! ), which seems in keeping with the spirit of the book. And from a design perspective I like how they frame the title. Definitely the waffle one. There are two plates, less lonely. It gives the feeling of sharing with someone you love. I’d also go with the waffle cover. I recently found out I’m gluten intolerant, and one of the hardest parts has been watching my roommates make waffles and bread and not being able to eat it. The salmon looks delicious, but a salmon recipe could be in any cookbookGF waffles are what sets your book apart. The salmon looks more enticing than the waffle for eating, but stylistically I love the waffle cover more. It has warmer colors, the title is not in the center, and it screams cozy. Looking forward to seeing the final book. Also, really, they look freaking delicious. Those waffles look wonderful! Not everyone thinks of savory waffles so it’s familiar and a surprise. Can’t wait for the book! The cover on the right – but not just for the waffles. It’s to do with the photograph and the way there are shadows under the plates. I’m an artist, and I look for form in things, and these plates look as though you could pick them up. The side-on lighting makes the plates and the waffles themselves appear more substantial.. I think this would make people more inclined to actually pick up the book in the first place..
Really looking forward to reading it, by the way! I would be drawn to the salmon cover. The waffle cover makes me think “I don’t own a waffle iron, I will never make that, and instead I will just be lazy and buy gluten-free frozen waffles at Whole Foods.” I would feel differently if it were pancakes which don’t require a special kitchen gadget. The salmon dish I would actually prepare. Maybe incorporate the waffle picture in a smaller size on the back cover? Hooray, so excited for cookbook #2! I’d go with the salmon cover. So much of the focus in the gluten-free world is on, well, gluten, and how to replace it in your daily life. That’s important, but the best way to simplify gluten-free eating is to focus on things that are naturally gluten-free…like salmon. I like the salmon cover over the waffles from an aesthetic position as well. The green relish makes the pink of the salmon really pop, while the visual effect of orange smoked salmon on a brown waffle is less striking. Whichever you choose, though, they’re both lovely pictures. Good luck with the finishing touches on the book! Looking forward to this book to coming out! Both are beautiful shots! My first thought is the waffles, as folks may be keen to see how to make them gf. Haven’t read all the comments to see if anyone already suggested this, but can they somehow use both images? They’re both gorgeous. Good luck and happy fall! I would go for the salmon shot. the moment someone thinks of a dietary restriction all the things that you CAN’T eat coming screaming to the top of the list. its nice to be reminded that, “Hey, there’s nothing scary about this. Look at everything that you CAN still eat!” The fish does that. 🙂 They are both beautiful! Actually, I would go for the salmon cover! The waffle cover is nice, but I think it seems more ordinary since there are already several gluten-free dessert/bread/breakfast cookbooks out there. The salmon cover seems to go more with your desire to celebrate the foods GF people can have already rather than focusing on substitutes for foods we can’t have. I would buy the Salmon cover… I prefer to cook naturally gluten free everyday. I already have several cookbooks for GF substitutes like waffles that I make once a month, or less. Everyday cooking is ingredients we have and can buy simply, and make with normal pans in the kitchen. New flours, new blends, and a waffle iron just doesnt scream GF Everyday to me.. I am sure either will be very successful however!! You’ve got to use the photo with the waffles! Please! But what speaks to me about the waffles is that there are two plates. You write so much about food’s power to bring people together. Seeing two plates reminds me that food, gluten free or not, is about family, about community, about togetherness. One plate just doesn’t do that for me. Whichever cover you end up choosing, I can’t wait to see the new book! Love the waffle cover best. The color contrast jumps out better, and I like the fact that the food image isn’t divided by the title. I imagine that there are people who would see the pic on the left as boring, if lovely, and the one on the right as intriguing. So this may be informative but not help you make the decision. Sorry about that. ;^) I do like the slightly offset title on the pic on the right, though. The waffles, definitely. I love how the title breaks the two plates up–plus they look stunning! Both covers are fabulous. You can’t go wrong. Pick the one that speaks to you most. I like the waffles more, personally – I’m not even a gluten-free eater, but I think I’ll be getting this cookbook, it sounds great (and maybe I’ll get one for my mom! She’s always looking for healthier, but easier food choices). I also don’t have a waffle maker, but I think that will change soon. p.s. I love using your crepe recipe/ratio, by the way! You reintroduced crepes into our dinner repertoire, and I have to thank you for that! We wound up making some recently with chicken-of-the-woods mushrooms our friend foraged for us, and it was a memorable meal for sure. I think it is the graphic treatment of the title bar across the middle of the waffle cover that makes that book stand out. Would be helpful to see the salmon cover with the same title bar and tow dishes of salmon. Since many gluten intolerant folks struggle with eating too many GF grain based treats, I prefer the salmon cover for its emphasis on healthy whole real food. The waffles are speaking to me in multiple languages! Congratulations on your new book!! The waffle cover grabs the attention of anyone who’s gluten free. Waffles! The fact that the waffles are being used like a blini, with salmon and capers and a bit of creme shows that this is no ordinary GF cookbook. Visually the waffles cover is better, too. As a celiac and a B&B owner/operator, I would choose the waffles! Graphically I like the one with the salmon. I like the clean, bright look and the way the green lettering picks up the green in to photo. But, if you are touting this as a gluten-free book then I would go with the waffle cover but maybe a different color on the wording “Every Day” as it just does not pop the way the other cover does. Definitely the second one! Better colour, better view of the food, much more appetizing looking meal. Thank you for your hard work! Looks like it’s waffles. Beautiful cover. I can totally see how a lot of people eating gluten-free would want the waffle. But I love the freshness and vibrancy of the salmon photo. And the waffle photo would make me wonder if the book was mostly breakfast recipes. the first one! more appetizing! I like the salmon as well. It seems like most GF cookbooks focus on the sweets. GF or not I don’t think eating lots sugary (even natural sugars) is a good thing. That being said I think most folks will pick the one with the waffle. I wouldn’t even pick up the salmon book, but the waffle cover had me. I’m going for the waffle cover also. They both use the design principles of thirds, but the waffle one seems crisper, and maybe it’s because it’s morning and I haven’t had breakfast. Excited for you guys. The salmon cover is absolutely stunning. Beautifully done, beautiful colors, and very inviting. The waffle one just looks unbalanced to my eye. Awkward. That was my initial off-the-top-of-my-head reaction to them before I read that feedback was wanted. So then I went back and looked closer at what was exactly on the cover. And though I can see where a GF cookbook might want to advertise normally wheat-made things converted to safe GF foods…. I still sit back and look, and the salmon cover is far more pleasing, balanced, and beautiful to the eye. Do GF cookbooks have to be all about converting the bready stuff? I do like the idea of a cookbook that I know I can just pick up and cook from –knowing that I’m not going to be faced with the problem of possibly needing to make some substitutions — and then having to figure out a proper conversion for flavor, texture, and volume of the gluten type ingredient. Looking forward to new dinner ideas that are already in-and-of-themselves lovely and 100% safe. So,very much looking forward to your new book. Both covers are lovely but I prefer the waffle since it is shows I can have “normal” food too ! The salmon is beautiful but I know how easy it is to prepare salmon without gluten but waffles would be something new to try ! Congratulations on your upcoming book ! They’re both beautiful covers, and well-designed. Waffles to me represent the thing I can’t make well, and would attract me to a gluten-free book. Salmon I made before this gluten-free journey. Both covers are beautiful, but I think I prefer the second option with the waffles. I love the warm, homey feeling of the photo. I think the one on the right looks a little bit cleaner. Or maybe use the face from the right over the food from the left. The red in the tag on the left stands out too much for my taste. It draws the eye too much to that and not to the whole cover in general. Both covers are beautiful, but I personally find the salmon more aesthetically pleasing to the eye – less unsettled somehow. Both however, also remind me so much of another wonderful cookbook: http://www.amazon.com/Super-Natural-Every-Day-Well-Loved/dp/1580082777 but I’m guessing your marketing team has already sussed all that out and decided that’s OK?! Best of luck – looking forward to seeing the inside of whatever cover you decide on! yes, i agree…at first quick glance, i thought this was a new book of heidi’s …. especially the shot of the salmon, colors & everything are so very similar in lay-out and design to heidi’s cookery book…ditto the sentiments that your marketing team did check & there is no conflict… the photographs here are stunning, well-done to penny… i like both covers, but if taking into perspective GF recipes, the waffles pull me in more – for all the reasons cited in the comments here…another great book coming out, something to look forward to in april to purchase!! congrats!! I like the waffle one. The colors pop better and just appeals to me a bit more. My vote is for the salmon, particularly with the title of the book. In our house, for better or worse, the waffle photo looks more Saturday or Sunday morning time to linger-don’t need to rush out the door-brunchy. The salmon looks like something we could pull off on an every day. Plus I love the fresh colors. I’ll be buying your book regardless of the cover!! I love both covers, but am partial to the salmon! Can’t wait for April and congrats on the paperback release! I was impatient, so the hardcover version already has a special spot on my cookbook bookshelf! From a design perspective, I would never place the banner (option on the left), in the centre. Either above, as shown in the option on the right, or below the centreline. The waffles have a direct relationship to ‘gluten-free’ that many people might make a connection to first, over the salmon. I’m guessing that if you want to quickly identify with buyers who are looking for a classic ‘gluten-free’ book, that would make it an obvious book for them. The salmon shows that gf is about more than grain. For myself I keep all my cookbooks from ‘before’ needing to eliminate most grass plants from my diet, because they are about food vs. making accommodations. When I go looking for a new gf specific book I always look for baking books (by weight btw), because I want a tested starting point to riff from. So chances are good that if I was unfamiliar with this blog, a cover showing me salmon would not draw me in, because I’ve got that covered. Waffles, please! They just look so inviting – especially formatted like this (two pictures of the waffles) – that I want to dive in and cook. I’m really excited about the new book. The structure sounds perfect! Thank you for inspiring me to get in the kitchen more often and to share the experience with my boyfriend. The salmon picture is more pleasing to the eye. In the waffle picture my eyes are all over the place, not certain where to focus. I am so excited for this book! I have many cookbooks that I love but use infrequently because I don’t have the time necessary to make the dishes. Your new book is exactly what I have been looking for – healthy, accessible, and functional (and delicious!). Both covers are lovely, and you can’t go wrong with either. I agree with some of the previous commenters – go with your gut. We’re very partial to the waffle cover! Can’t wait to see what this cookbook has in store. I would be more likely to pick up the book with the waffle cover. Both are beautiful, but salmon is a once-in-a-while dish for us. Breakfast for dinner is what we do when we are bone-tired exhausted with no money left to go out to dinner and need to make something the kids and adults will love. In that sense, the waffle cover seems to go with the “everyday” moniker better. It also ties in better with GF for me. I can make salmon GF because it already is. Gluten-free grain-based foods are the reason I buy GF cookbooks. 🙂 Just my 2 cents. i think what others are saying is right on the money. many people are only thinking about baked or bready things when they are starting out as GF-eaters/cooks. i think that audience will respond to the waffles. I like the waffle photo better. I just find it more appealing. Waffles – and not just because of the aforementioned intrigue over gluten-free waffles (that’s pretty straight-forward). The picture is just more aesthetically pleasing. It jumps out at you, whereas I think maybe the salmon isn’t as eye-catching (but put that plate on my dinner table and I might be singing a different tune). I love the aesthetics of the salmon cover. So refreshing, light and inviting. The waffles seem to evoke a much more emotional response. I have your first book and am looking forward to the new cookbook! When I saw the paperback on amazon a week ago I thought “yes! The second book!” then realized what it was. Is there anything different about this one besides the cover and it being paperback? Any extras? In regard to the actual new book, congrats! I love the idea. Being a newer reader to the site I keep coming back to learn how to cook gluten free bread. Your first book was lovely but it wasn’t quite what I was expecting. The new book sounds more relatable to those of us that aren’t chefs, may be just learning to cook well, and need fast meals. By this theme I think I have to choose the waffle cover. I like that the words every day stick out. The salmon photo is gorgeous, a work of art really, but it intimidates me just a little to think of making it. My favorite cover so far is actually the paperback one, it has two different foods and a picture of you two. Since this was supposed to be called feeding lucy its too bad you don’t have a picture of her reaching for something she loves. Whatever you choose I will be buying it, can’t wait! i like the one with the waffle!! its something i can’t just eat anywhere, it has to be special (aka gluten-free) for me to have it. salmon i can get any any cook book, a waffle has be be from a special cookbook, and most of my special cookbooks don’t have such pretty pictures. The waffles. Don’t get me wrong…I love salmon and the variety of ways to fix it. However, when I look at those waffles my mouth just waters! The pictures makes them look very delicious and intriguing and I can’t wait to try them. I think too it appeals to the creative cook in me. There’s a chance they might come out looking like that. 🙂 The salmon, although gorgeous, somehow seems to be something more formal that I probably won’t ever pull off. Both look great, but I would definately go with the waffles!!!!!! For me, it’s always about the light, the light, the light. And I like the light on the waffles better. Here’s to your new book, whatever it looks like! Like many of the other comments, instantly seeing the covers I said, “waffle!” It was one of those foods I missed so much when first not being able to eat gluten. So often you see fish on the covers of cookbooks…but waffle on a gluten-free cookbook…that would make me pick it up without even opening to check the rest of the book…and then of course, would be knowing you guys wrote it! Also, love the explained layout…can’t wait!!! Being relatively new to gluten-free living (1 month and counting:) the waffles would pique my interest for obvious reasons. From a marketing perspective I think the waffles win. However, the salmon dish is more appealing to the eye. I’d say the waffle cover!! For sure! Our family recently started eating g-free because of our 3 year old son. We are really struggling with those cookie, cake, bread, and breakfast options, so my interested is definitely peeked seeing the waffles. I love the sound of this new book and it’s at the top of my list. I just started following your blog and love it! Thank you for sharing. I vote for the waffles. Checked with Zoë: she concurred. So warm, so inviting, and visually, great depth and graphics. Beautiful, you three. Can’t wait to see the insides! I liked the Salmon cover! The waffle cover is way better. The salmon looks too much like something Heidi at 101 Cookbooks would do– very light and bright and filled with natural goodness. Not that you don’t do the same, but your website and writing are darker than that and it really doesn’t match your style. The waffles are more playful, colorful, and are more your “voice”. The side lighting creates more of a mood, which fits with your posts that aren’t always about happy things. You talk about the good and the bad, and those waffles capture both. I love the waffle one; it illustrated the gluten free component as well as a luscious-looking dish. Can’t wait for it – I like the first one, but as you say it’s not for everyday cooking in a busy house with kids. I’m voting for the waffle cover. The design is much more balanced. In the first cover, the title feels like it’s in the wrong place. If you like the salmon photo better, I feel the composition needs to be rearranged. Seriously, I am so excited for your family. Love everything about you guys and especially how you welcome all of us into your cozy kitchen! Definitely the waffles, mainly because they look more like “everyday food” for us lazy SOB’s who don’t like to take more than 20 minutes to cook a meal and ignore the snobbery of those who do. I love the Salmon image, but I think the Waffle titleblock reads better, so I’ll opt for Waffles. Waffles! Whatever you choose, I’m looking forward to the book. My visceral reaction when looking at those two photos is that the one on the left makes me want to buy the book. The one on the right makes me want to lick the cover, buy the book and then eat everything in the cookbook. …Mainly for the, “Wow! Waffles can be gluten free? !” factor that the others have mentioned, but also because the centred bar in the salmon image bugs me. I don’t know why it does, but it does. But I kind of prefer the font colours of the first one. Ooooh the waffle one just pops out and says buy me! I like the waffles! Both photographs look beautiful and delicious, but the colors pop more in the waffles photo, just looks more striking to me. Either way, can’t wait for the new cookbook! The colours on the left are fresh and inviting, but the idea of GF waffles makes WAY more sense for a cover. I like the salmon one. Not sure why, but it caught my eye first. The waffles with salmon and capers do not come across to me as an “every day” meal, but the salmon does. I do get what others are saying about the waffles and the correlation to gluten-free, but if someone cannot have gluten, they are going to be specifically looking for a gluten-free cookbook and the title speaks for itself. Definately the waffle!!!! Only because the salmon (as stunning a shot as it is) is something I could see on lots of different books, but the waffle is interesting, challenges the whole “waffles as a sweet” and made me want more!!!! I cannot wait for the new book- it sounds amazing!!!!! I vote for the salmon cover. I prefer the colors and think the food looks incredibly delicious and fresh! At first glance, I preferred the waffle cover for all the reasons your readers have mentioned. However, when I saw that it was waffles WITH salmon on them, in other words, savory waffles with fish, I thought, hmmm… Americans might not like the idea of fish on their waffles. In fact, they may find it weird and be turned off the cookbook entirely. So…I vote for the grilled salmon cover. Can’t wait to buy the book and try the recipes! GF Girl and the Chef is still one of my top five food books, I often give it as a gift. Thank you for being so fabulous! PS.Apparently, not many (any?) of your readers noticed that the waffle dish has fish on it. Everyone has commented on baked goods, breakfast foods, syrup and buttery, cravings sfor sweets, etc. I wonder if reading the fine print would have swayed your readers in the way they voted?? What about putting the salmon on the front cover and the waffles on the back cover or vice versa?? Best of both worlds! Btw- I love both layouts. Thanks for sharing them with us. I think the salmon. Not because it is especially awe inspiring, but because it looks more”everyday”, which is what you are going for! I can wait to reserve a copy!! While I appreciate the pro-waffle group, I am allergic to dairy and would definitely avoid any book with a huge pile of dairy goo on the cover (sorry, just jealous). So I would pick the salmon cover. Why? Salmon feels special to me and waffles don’t. Oh my, I see why you’re asking because it’s nearly impossible to decide! My first instinct was waffles. But I honestly think you can’t go wrong with either. I’m SO looking forward to this book! My life with 2 kids is busy, but I love good food and need some vibrant variety very badly. Congrats on another wonderful creation. I did read the fine print. I am not a fish eater and wouldn’t make either recipe. The waffles cover wins my vote. I might make a waffle and put something besides salmon on it. Waffles. Bold and eye catching. Gutsy. Everyone else puts salmon on their covers. It also conveys a home made, take the time to cook feeling. While both look delicious, the waffles are more appealing and the colors more attention grabbing. Your name alone would make me pick up the book. However, regarding the photographs, I like the simplicity of the salmon photo. I’d rather eat the waffles but because there are two photographs, one that is not wholly on the page, I feel that there is not as much harmony, visually. Thanks for your super blog and all that you share with us. You have blessed and helped us on the gluten-free journey. I’m with the salmon cover folks, despite the appeal of waffles. The pink and green is simply prettier. It also indicates that this is not going to be “just” a baking book, of which there are plenty, fortunately. I think the title shows more clearly. Don’t you love getting contradictory opinions? Go with your (healthy) gut–the book will sell with either cover! I like the second one. Its brighter and draws your attention to the book more. I also like how there are two dishes on the cover with the title etc in between rather than having the title over the food… Definitely the second one!! That or do both, that way people will chose the cover they like best, like the collectable magazine covers you get occasionally… not to sound like too much of a nerd, but i would have one for myself (waffels) and the samlon for my mother – we both look at different things on book covers despite having simalr tastes in books and food. The salmon cover just looks more appealing to me. I understand people who crave GF waffles, and lean that direction, but breakfast is not nearly as complicated to get on the table as dinner is. I think a dinner photo sends a better message–and I love to eat breakfast for dinner, but that is not what comes to mind when I see the waffle photo. I asked my husband for his reaction to, and his immediate gut reaction was “Definitely the one on the left.” Just our two-cents worth. We will purchase it regardless! p.s. I don’t need a picture to want to buy this book, but if I didn’t know you I would be attracted to the waffles!! I think with special diets books people like to see something on the cover that should be faux pas and not able to be enjoyed on a GF diet. I say the waffles for this reason. Everyone loves a waffle! Plus the vibrant orange of that smoked salmon contrasting against the waffle and creme is eye popping! I cannot wait for your book. The love behind the words you use to describe it is inspirational! I only hope to pour so much into my book, while also chasing around a little human! 🙂 Congratulations! They are both beautiful. I would hate to make the decision! That being said, I don’t eat salmon or waffles every day — or even every week. I might eat salmon every other week, if I’m lucky, but waffles just don’t get made (if I’m honest) more than once every 4-6 months or so. Other thoughts: Waffles incorporate a grain, while the salmon doesn’t. The salmon being grain-free might be an attraction for the Paleo folks. Additionally, waffles require equipment. Our waffle iron is a BEAR to clean, which is why we don’t use it that often. Normally I just go the pancake route — virtually every Sunday morning. Another thing: Salmon is from the Pacific Northwest, which is a nice touch. I love your blog and am very excited for the new cookbook. Be well, Shauna and family! Can’t say the cover would make any difference to me. I like both and dislike things about both. Maybe that’s just me. I have a well-used cookbook with a truly ugly cover. It’s what’s inside that matters! Can you do a split? Shouldn’t it be the best of both worlds? One would expect a GF book to be obviously GF meals. On the other hand, the movement to include historically scary foods into a GF life is sellable and trendy. Do both? Because your recipes are real life, and real life includes both sides of deliciousness. I’m voting for the waffles. The salmon is lovely – but it just doesn’t say “everyday” to me in the same simple, homey way that waffles do. Either way? I’m buying this one. I prefer the one with the salmon. I am gluten free and Paleo. I always am looking for good whole foods for dinners. I don’t need anymore junk food recipes, gluten free or not! I would probably pass the waffle cover up because I thought is was mostly remakes of gluten laden foods. I want the recipe of the dish you are cooking in the article. That looks really yummy! If I was choosing a meal I would go with the salmon. But the waffle photo is more compelling with its rich colors and geometric forms. I like the one of the waffles, just my initial gut reaction. I vote for the waffle cover. It feels more gluten-free specific. And though I’m a vegetarian, your treatment of this waffle tells me there is some innovative fun to come! Looking forward to April! I think anyone who loves your blog will want to buy the book no matter what’s on the cover. For the uninitiated, however (either to your blog or to the gluten free world) I agree that the picture of the waffles is a loud message that ‘this is do-able even gluten free’ and also the anticipation of ‘I wonder what else is do-able’. Also, I think the title (‘everyday’) suggests that it’s more than desserts. Based on purely the image that caught my eye first, I think the waffle photo is the best choice for the cover. The salmon is too pale and boring (although I’m sure packed with flavor). The waffles have a variety of colors and textures. I also like that there are two waffles, each bording the top and bottom of the title. It just works. hmmm. i hate to say it, but both look really a lot like the cover of heidi swanson’s “supernatural everyday”…beautiful photos though. maybe the graphics can be tweaked? I pick the waffle. I’d be much more attracted to a gluten free waffle on a cover than salmon. Who doesn’t love waffles?? Waffles. There is less “business” and distraction that exists w/ the salmon photo because of all the herbs. The waffles pic looks cleaner yet also quite delicious. Well, we didn’t have anything to do with the design. They are handed to us! However, our designer is wonderful. She arrived at the design through a series of choices. I’m certain there was no deliberate attempt to make it look like Heidi’s book. That’s what creation is like, isn’t it? Oh, definitely the second one! The colors are much more striking and I like how the title bar separates the two plates–it makes me think of you and the Chef sitting across from one another sharing breakfast together. Oh, the waffles! The salmon is a) gluten-free anyway b) doesn’t really give off the ‘everyday’ vibe. But the waffles are lovely looking, warm and make me want to crack the book. The salmon will just blend in with the cookbooks around it. And I like the placing of the fork and knife in the waffle picture. oh plus there are two plates in the waffle picture. Suggests family and sharing! I’d go with the salmon. I don’t actually like fish but the waffle picture would tell me that many of the recipes call for things I don’t actually keep on hand, like xanthan gum. But both pictures are beautiful! Well, we don’t use xanthan gum any more! And part of the idea of this book is the you won’t need so many ingredients. The waffles. Hands down, the waffles. Waffles. The salmon makes me think it’s just a bunch of recipes that wouldn’t have gluten in them to begin with. The salmon cover is the most visually appealing to me. Waffles!!! The colors and tones just make the cover pop right out at you! Since being diagnosed celiac a little over a year ago today, I have had waffles on my brand new non-glutenized waffle maker twice. The gluten free mix from the farmers market is just too expensive to buy, and the store bought GF “mixes” taste and look horrible. Breakfast for dinner was something I always looked forward to as a child. I can’t wait to buy your book – you can bet that chapter will be the first one read. And no, I don’t think it would make the book look like a breakfast cookbook. Thanks Shauna, for continuing to tell me your story, so I can have hope with my own. Waffles..more texture and visual interest to me. Good luck and thanks for your lovely writing. Definitely the grilled salmon cover–I’m craving some right now! I love this post. I still remember getting my Celiac diagnosis and not knowing how to navigate my kitchen anymore, especially baking! As much as I enjoy the recipes, I love hearing someone else share her story and experiencing both things that are similar and things I never would have thought to do or try. Love the salmon, looks classy, but GF waffles? I’d buy it just to learn how to make those! Best wishes moving forward! Love your site and books! So exciting! The first book in paperback is great news. But, even better than that, I’m so looking forward to this new book. And, like you, I’m partial to Feeding Lucy. It’s real. Can’t wait! And the right cover is beyond amazing. I like the warmer tones in the waffle cover, it just seems to pop a little bit more. The salmon one looks a bit washed out to me and the title disappears into the image. I must say I sooo love salmon, but it was the waffle that caught my eye immediately. It’s hard to find a good waffle and your picture looks delicious. The colors pop better than the salmon, making it easier to identify immediately. At least, that’s my take! Good Luck! My immediate impression was to pick up the salmon photo. I was very drawn to it. But after reading the first 20-30 responses…. well, people have convinced me that waffles make more sense. So. Kind of a vote for salmon, but also an agreement on the waffles. And, please write a book that truly is titled Feeding Lucy!! Love that! ooooh oooh –Maybe a children’s book!!! Definitely the waffles – GF salmon looks yummy but GF waffles is the thing I need to know how to make!! That picture makes me think that the inside of the book has useful info on making foods that aren’t typically GF. The pink and green pastel colours of the salmon are beautiful too, but the cookbook I’d gravitate towards if they were displayed next too each other in a bookshop would be the waffle one. definitely waffles. the colors pop more, it’s more visually stimulating. the ratio of the design is better, it feels a lot warmer and you and the chef are warm. and I agree with other commenters that it’s a good idea to have something that isn’t naturally gluten free on the cover. also it matches your first hard cover better. can’t wait to buy it I love your first book! I vote for the salmon. For a long time, I didn’t even look at any gluten-free cookbooks because I thought they were all about just modifying recipes for things that would otherwise contain gluten, and I just wasn’t interested. The salmon shows that you’re about more than just being gluten-free. Hope to see you in Seattle this Fall. Also, the asparagus soup was the hit of the Summer form my kitchen. But, the salmon looks easy and tasty! Its a more intriguing photo, based on the lighting, etc. So funny everyone said the waffles! I think the salmon is “safe” but the waffles scream “try me…” which is way more your attitude! Waffles. The minute I saw waffles, I thought about the fact that I haven’t had them in the five years I have been gluten free and how much I truly miss them. They used to be my favorite as a child. I can’t wait for the book. I spend every sunday sifting through your recipes and making lists for my husband to create during the week (he although not gluten free, is a fantastic gluten free cook while I am not). Congratulations, I can’t wait to own it. The waffles by far! Color tones are warmer and more inviting. Gentle, golden light slanting onto the food and the position of the fork say, “Relax and eat well. This food doesn’t take long to prepare.” In contrast, the position of the serving utensil alongside the salmon, handle away from the viewer, says more formally, “I’ve prepared this food to serve to you.” Also, waffles are recognizable at a glance and feature highly on the “wish” list for the gluten-free eater. All the best with your book! I enjoy your blog. I’d definitely go with the waffle one! My eye was drawn to that immediately and kept going back. I think it’s more intriguing – everyone knows there’s no gluten in salmon, but waffles? How does that work? Then you pick it up to find out. I’m looking forward to this book – I just recently went wheat-free (to help even out blood sugar levels) and found your website as a result of recipe searches. Lovely! I’d go for the waffles! Although they are both beautiful pictures, I would definitely go with the second one. From a marketing perspective, you obviously want your book to appeal to the largest possible number of buyers. People who read your blog, like myself, are going to buy the book either way. But for the uninitiated, the image of gluten free waffles will be more appealing. Plus, there are a great number of people who do not eat fish and would pass right by the book if it had salmon on the cover. Waffles appeal to a larger demographic. Just a thought. Either way, I can’t wait to buy my copy!!!! I like cover shot with the waffles. People! Gluten-free waffles are the first thing I ever made gluten-free. Take your simplest waffle recipe and substitute with any gluten-free flour mix (seriously, I’ve used Betty Hagman’s mix, GF Pantry, Barbara’s, Bob’s Red Mill and Shauna’s whole grain mix). Or, use any commercial gluten-free pancake mix and use the waffle instructions. I use the recipe that came in the instruction booklet with my waffle iron, it never fails. I love the waffle cover. As a mom of twins, one of which has a gluten allergy, I am drawn to the idea of gluten-free foods we can share together as a family. Pancakes, waffles, and breads were the most complicated part of my journey as a GF cook, and I still try to experiment with new flavors for our traditional breakfast foods. Salmon, because of its cost in Louisiana, just isn’t a make-at-home weeknight dinner for us. The allure of a shared breakfast with my girls, theirs minus the salmon, makes me happy as a mommy. I love the visual appeal of the salmon, the contrast with the title, and the look, but it says “gourmet” to me, not “I’ve got 40 minutes to get dinner on the table or there will be mutiny on the ship.” Love your blog, Shauna, and the heart you give to cooking for your family. James cracks me up and brings joy to my kitchen. Well done, and I’ll be buying both your books in hardback for Christmas. I love the fresh colors of the first but also agree with many others- the second one with the waffles “pops” more and looks like it’s going to help gluten free folks be able to eat things they often miss- waffles and other grain based dishes, etc. Congrats on everything! The new book sounds great, even for those of us who do eat gluten but are always wanting creative healthy cooking ideas, especially that factor in the littlest ones in the family. The salmon one is pretty and looks like a cover but I can understand how the waffle one is more of a reason for a gf person to pick up. If only the salmon one had a brioche or something bready next to it! Waffles all the way for me! I like the waffles one — it looks more homey, which sounds like the look you want for this book. The salmon cover looks more rarefied and fahncy (beautiful, but a little daunting?). Oh, both of the cover options are so lovely! I want to hang them both on my wall. Haha. But for book purposes I vote for the second picture. The lighting seems a litte more warm and inviting, even though the salmon looks delicious in the first picture. The warm lighting of the second one makes me want to reach into my screen and pick it up. I like the balance and color of the waffles. Having the two plates gives me a sense of plenty, of sharing, of generosity, as well. The waffle one really appeals to me – it “pops” more. The text stands out more distinctly compared with the salmon cover, which feels a bit bland to me. And most importantly I love the earthy, warm tones of both image and text. I am so looking forward to the new book! It sounds amazing! CONGRATS! Oh – yes and I forgot to say – WAFFLES! No GF person could resist a GF book with that on the cover. Definitely the waffles. The salmon looks delicious, but a tad pale for a book cover. Just a thought. The waffles, definitely. Brighter, sharper, more catch-your-eye impact, more “everyday”. WAFFLES! Homey image, two plates, feeding a family. Yes. I don’t have a waffle iron, so I would be less likely to pick up the book with the waffle on front. I have a small kitchen, and that’s something I’m not likely to own ever. I’d definitely go with the salmon. Always and forever – WAFFLES! But I think the photo really stands out from other GF cookbooks featuring baked goods on the cover, as you’re offering a new variation on the standard waffles & berries or syrup routine…I have come to ADORE savory waffles, and the idea of salmon, creme friache and capers sounds divine! I now rely on my waffle maker as a sandwich bread alternate, and we’ve made sharp cheddar and chive waffles, cornbread waffles with jalepenos and jack (top either with a poached egg for a quick dinner) and we’ll stash extras in the freezer to use for open faced sandwiches during the week, as the waffles are excellent in the toaster! i also vote for waffles. that being said i think you should pick whatever photo best represents the kinds of recipes you have in the book. nothing worse than picking up a book with a cupcake on the cover and finding only one cupcake recipe. does that make sense ? The waffles look gorgeous, even though I wrinkle my nose at what you’ve put on top. I’m that weird Seattle-ite who doesn’t like smoked salmon! But I agree with the homeyness of the image on the right, even though the salmon pic is GORGEOUS. Can’t wait to buy it! My wish for you is that people who do not have to or choose to eat GF will buy this book. I think of friends who have catered to my needs and a book with a delicious looking waffle is something that may be out of their league without your guidance. I would defiantly choose the cover with the waffle pictured as it is everything but conventional! with the words Gluten-Free – I like the waffle picture best…of course they are both fabulous! I loved your first book and your website is the reason I discovered I needed to be gluten free. I agree with the majority of the poss that gluten free waffles should be on the cover. I paint and the colors in the first cover are more appealling, Something about the way the two plates are split up and the ink colors in the title upsets my “artisitic” sensibilities. The title ink colors sem to clash with rather than enhance the salmon in the photo. I will buy your new book whatever the cover looks like, because I know there is goodness within and in the authors. Can’t you sneak Feeding Lucy in somewhere as a subtitle? Oh, it is definitely the waffles. Beautiful and inviting! waffles – much better contrast which makes it more eye catching and intriguing! I just recently had to go gluten free and I’ve been blogging about my experiences. I can say 1000% without a doubt the waffle cover is more appealing to me. As tasty as the other dish looks I already know how to grill salmon. Tempt me with waffles. I like the look of the salmon cover better, but it doesn’t scream gluten free cookbook like waffles do. You mentioned that you updated the recipes to use psyllium husk powder. Will those updates be available at some point to those of us who bought the hard cover cookbook? Waffles for the win! Can’t wait to have this cookbook in my hands and I hope Austin will be a stop if you have a book tour. Best of luck and thank you again and again for sharing your joy! My vote is for the book cover on the right. It is brighter, more cheerful and who doesn’t love waffles?? Hands down gluten free waffles! The waffles cover caught my eye right away. It’s bright and pops out even on a computer screen. Before my brain was even able to connect gluten free + waffles = amazing, I noticed the natural prettiness of the cover. Good luck choosing. Can’t wait to purchase the new book! I like the salmon photo better but the design of the other one better. The colors to go with the photo make sense of course, but the centered title seems unbalanced. Looks like you have a ton of input here and I’m fascinated to hear the final tally on salmon vs. waffles, but I gotta go with waffles. Had a little debate with myself regarding the audience you want to hit… for the totally GF crew, a great recipe for something traditionally “gluten-y” seems like a bigger draw, but if you want to attract an audience that goes beyond the GF demographic, maybe salmon would show them that they don’t have to be “gluten-free” to enjoy eating that way. In then end, I’m sticking with my first answer though, because I like the warmth of the waffle photo and the unusual combination of ingredients… Something creative that I haven’t seen before makes me want to invest in the book (and, more challenging, make space for it on my shelf) to see what other fun stuff is inside. I like them both but for different reasons . The salmon looks so fresh and the colors attracted my eye right away. The dish looks easy to make as well, just salmon and a simple relish. The waffles remind me of family because we used to make waffles or pancakes on Sundays, usually dad and me together. So there’s a bit of nostalgia with that one. From a design and graphics standpoint, the waffles wins. The two separate plates highlight the food and the title much better. And the colors are warmer, I’m much more drawn to that homey warmth. From an everyday fresh standpoint, the salmon wins. The photo is brighter and a green is always a good choice for conveying a fresh feel. I almost wish there were some scallions (just a few for pop!) on the waffles, because then it would clearly win. But you’re right, both photos look delicious. The second: the waffle photo is brighter and cheerier, bolder and the title shows well. I vote for the waffles! I love the waffles shot! It really is everyday food to me. I can’t wait for the new cookbook! Thanks for sharing your recipes and a little piece of your life with all of us. waffles. since baked goods are an issue for celiacs, waffles would get noticed first. The waffles strike a bigger chord for me. Those seem like a thing that most folks living gluten free may be missing and haven’t been willing to tackle. Love the waffle cover – it’s so bright and it would pique my interest. Waffles. Waffles. Waffles. In case I can vote more than once. I’m drawn to the cover with bright green but vote for the waffle cover. Like others I would be more likely to check a book with a clearly bready cover. Also, the title is much better placed and easier to read. I’m with Andrea who said just a few scallions or something else green would ramp up the waffle photo. I’d also love access to the psyllium-ized recipes from book 2. How can those who bought the hardback version get them? Definitely suggest going with the waffle cover. It pops off the page more and as a GF diner and cook it’s also more intriguing. Your writing is fabulous and regardless of the cover, I can’t wait to purchase it! I agree with all of the well thought out replies above and really like both covers for different reasons. In the end… I vote for the waffle cover. All the best to you!! Congrats on the book!Looking forward to picking up a copy! Waffles AND salmon, let me at it! Much more appealing that salmon by itself. Go with the waffles, I NEEDnthT recipe!! The second one is more inviting, because it is a dish you are serving for two. I think for many people eating GF can feel very lonely, but in the second photo you present a comfort food they probably miss (waffles) that it is inviting enough to serve to a presumably regular GF eater. Oh wow! Such beautiful shots! And that, I think is what you want. For someone to see the cover and really WANT to open the book and buy it. I live to eat waffles so the choice is easy for me. And such a beautiful choice–I’d love this cover on a cookbook in my house! Do both!!! Like the first book. Both together would make me feel so many things. Definitely the waffles for me. The salmon picture is nice, but again, it is gluten free by nature. Also the waffle photo will appeal to veggies and non veggies alike. Waffle cover. Looks like breakfast in bed. Yum. the salmon cover catches my eye more visually. it’s cleaner, brighter. but the waffle one makes me more curious as baking gluten free is more difficult than cooking a salmon dish gluten free. can’t wait! The waffle photo is more appealing to me… for all the reasons listed above, so I won’t be redundant. The second cover is much more colorful & alive. It looks happier! The one on the left is more monochromatic & bland looking, even though I like salmon better than waffles. Non-gluten waffles call your audience more. By the way, I enjoy your blog even though I can eat wheat, although I prefer the heritage varieties. I personally like the one with the waffles because it is a representation of all the types of food I’ll like to eat and know how to prepare: proteins, carbohydrates, veggies, sweets. What drew my attention was the waffles. I’m newly diagnosed intolerant with a friend that can’t afford the bloodwork trialing gluten elimination for her migraines (with apparent success so far). The salmon is beautiful, but it’s something I already know we both can eat. The idea of waffles, now that’s something I see as a challenge right now. The picture is lovely, too. I guess I’m in the minority. I would go with the left. It is a beautiful image of a beautiful meal. There are so many GF cookbooks out there that focus on baked goods, waffles etc. I don’t like them. Anyone can figure out how to put GF flour in the place of regular flour (not the way you guys do of course) But to me I buy cookbooks to learn about real cooking, and the passion of cooking. I’m tired of cookbooks focusing on finding ways to duplicate the foods I can’t have anymore. I want to focus on the foods I’ve never even tried. Which is always what you do. Your recipes and stories make me fall in love with food that I never would have wanted before. I am going with the waffle crowd. They look luscious, and I think a great many GF folks would feel encouraged that they are possible in the every day scheme of things. I excitedly downloaded your cookbook (Kindle edition) on Amazon because you mentioned it had been updated to be gum free. The edition I just downloaded today is NOT gum free. 🙁 Is it only the paperback version that’s been updated then? Oh okay – perfect! And I’m assuming it’s the psyllium powder instead of the whole psyllium husk? Nope! The husks work better. But you can use the powder, if you want. Thanks for this tip! I was just getting ready to leave a reply asking the same question 🙂 It seems lately when I eat Udi’s I get bloated-so I’m assuming it’s the gums. I’ll try out this trick! Wow, you book sounds wonderful and perfect for our family. My doctor advised me I needed to to gluten free this week and I am so glad I happened upon your blog. Your writing is wonderful and the recipes look so yummy. I can’t wait to try a couple out :). Thanks for creating such a wonder blog.